1. 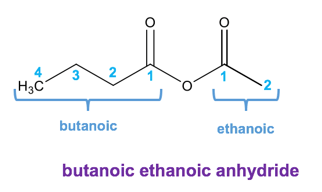 We number the parent chain in the direction that gives the highest priority (lowest number) to the carboxylic acid group. 2. We replace “e” with “oic acid”. 1. Follow the same rules as for carboxylic acids, and change the suffix to “oyl halide”. 1. The alkyl group attached to the ester oxygen gets listed first with the suffix “yl”. The parent chain then follows. 2. The parent chain starts at the carbonyl carbon and is counted moving away from the ester oxygen. Parent chain’s suffix is replaced with “oate”. 1. Any alkyl groups attached to the nitrogen gets listed as “N-methyl”, “N-ethyl”, “N-propyl” etc. 2. The parent chain starts at the carbonyl carbon and is counted moving away from the amide nitrogen. 1. Determine the length of the chain on either side of the bridging oxygen. 2. List both lengths alphabetically, replacing each suffix “e” with “oic”. 3. Write “anhydride” at the end of the name. 1. The parent chain is the longest carbon chain that involves the nitrile carbon. 2. Number the parent chain in the direction that gives the smallest number to the nitrile carbon. 3. Add the suffix “nitrile” to the parent name.